There are numerous ways to locate legal resources on the Internet, but if you are a Member of the Institute of Legal Secretaries and PAs, there is no need to look any further than the Membership area of our main website or our Legal Secretary Journal. Within the Members’ area of our website, there is a section called ‘Legal News and Journals’, where you can access many different resources. 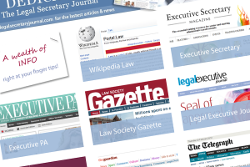 Online periodicals such as the Law Society Gazette and the Solicitors Journal can be found, as well as the legal sections of the Guardian and Telegraph newspapers. Blogs from the UK Supreme Court and Magistrates will provide you with a deeper insight into the legal world, and there is a very useful link to Wikipedia Law, where you can learn more about not only English law, but law around the globe. The Institute’s Legal Secretary Journal includes a section called ‘Legal Updates’, where important topics and events are published to keep you up to date with changes in law and legal issues. Our contributors are legal professionals who have their fingers on the pulse of the legal world. With this excellent supply of resources, you will be able to excel in your studies and in your work. You can embrace your career choice wholeheartedly and aim for a successful future.